Cowboy appeared to have died from a stroke. He started acting strangely and about two hours later wasn't moving at all. Blood came from his nose and mouth. It was really awful and I wish that I could have done something for him. This was a very sudden thing and couldn't be treated in any way. Sometimes freak things happen that have no bearing whatsoever on care or genetics. This was one of my favorite chins of all time. He was a wonderful daddy to his little ones and was always so gentle to his mate, Helene. I will look back at the time I had Cowboy with me and always smile because I really did love the little guy! He was just a joy...there's no other word to describe how wonderful he was...he was a JOY! The day I said goodbye to him was one of the more difficult days of my life. 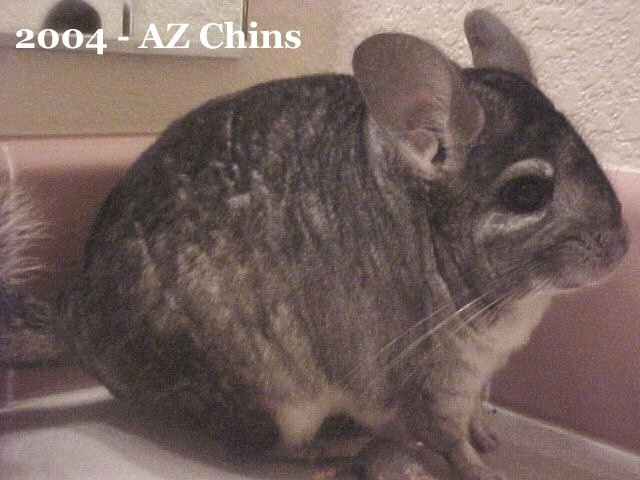 Please don't ever adopt a chin if you think that you can't handle losing one. They are just so special and wonderful. Losing a chin like Mr. Cowboy is just a tragedy. Still, knowing him made all the pain of losing him completely worth it. Goodbye, Mr. Cowboy. I'll never forget your little nose and face...you were the cutest, sweetest little guy. No one will ever replace you in my heart.